Social anxiety is definitely a burden that can be difficult to handle at times. It can range from smaller things to much larger scale anxiety, but regardless it is not picnic. Each personality type is capable of having social anxiety, but each will be affected by it differently. 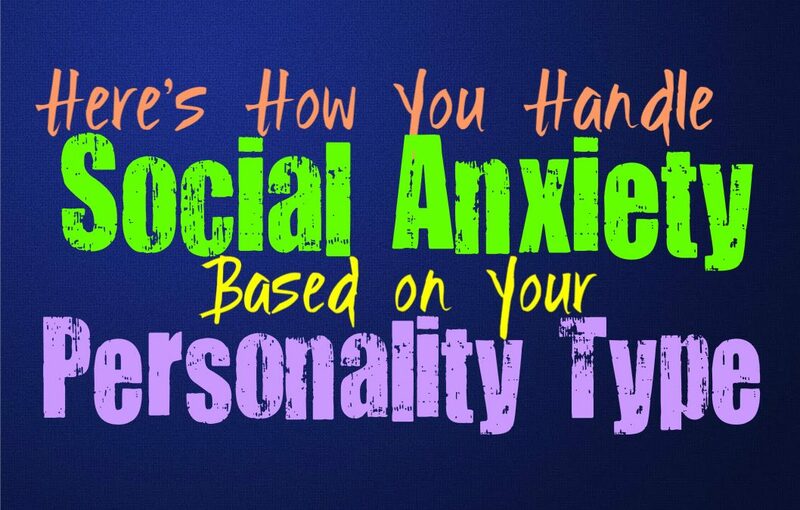 Here is how you handle social anxiety, based on your personality type. INFJs can sometimes struggle with social anxiety, which ultimately causes them to seclude themselves. They naturally struggle without plenty of alone time, but with social anxiety it becomes difficult for them to interact with others. INFJs without social anxiety might need their time alone, but at the same time they enjoy being able to make connections with people. With social anxiety the INFJ will doubt every action in front of others, and have a hard time opening themselves up to new experiences. It is definitely a challenging thing to suffer with for the INFJ, and it often requires the right people approaching them to be able to form the connections they desire. ENFJs with social anxiety definitely have a hard time coping with it, since they naturally prefer to be around people. The ENFJ will question every action and feel like they simply aren’t good enough. When they attempt to interact they often think through every word in order to feel more comfortable with the situation. ENFJs with social anxiety don’t stop interacting, they simply doubt themselves and put a lot of pressure on themselves to make the right impressions on others. They will likely continue to question their actions afterwards, analyzing and possible asking others if they said or did something wrong. INFPs with social anxiety often try to seclude themselves and avoid embarrassment. They struggle to be around crowds and instantly feel like they are being judged in some ways. The INFP with social anxiety definitely struggles to step outside of their comfort zone and often feels more at ease by themselves. With social anxiety the INFP might attempt to hide from people in some ways, but they don’t often want to make their discomfort known. They will attempt to seem just fine and shade the fact that they are actually feeling quite pressured and uneasy. INFPs with social anxiety might even use humor and self-deprecation in order to cover up just how uncomfortable they feel. ENFPs with social anxiety often try to overcome this by hiding their discomfort. They feel anxious about how their actions will be perceived, but they still continue to seek out connections. Their social anxiety can be truly challenging for the ENFP, since they still desire to be close to people. They are still outgoing and friendly, but at the same time they will doubt every action they make. They often feel like people dislike them, and have doubts about their relationships. The ENFP might even feel like their actions are causing others to be angry or upset with them, and they will often have a hard time handling this. INTJs with social anxiety often feel the need to shut themselves in, instead of wasting time in awkward situations. INTJs have a hard time really wanting to connect with most people anyways, and with social anxiety it becomes even worse. They rarely find themselves wanting to open themselves up to new situations, and will avoid crowds at all costs. The INTJ with social anxiety will have a hard time understanding how their actions are perceived and might constantly feel like they are saying the wrong things when it comes to trying to connect with others. They might also feel like their words are likely to hurt others, and they don’t intend to do this at all. ENTJs with social anxiety definitely have a hard time handling it, since they already put a lot of pressure on themselves. ENTJs want to be successful and strive to be as efficient as they possible can. They often feel happiest in a leadership role, but having social anxiety can truly stand in the way of this. ENTJs want to do what they can to overcome any struggles they face, and will likely try to push themselves through their anxiety. This often makes things worse, and causes the ENTJ to feel more like they are failing when it comes to doing what they need to. INTPs with social anxiety often try to keep this hidden from others, since they dislike exposing their feelings. INTPs find it easier to keep their anxiety to themselves rather than share it with those around them. They will often feel like their words and actions are being judged by those around them, and put a lot of pressure on themselves to behave a certain way. INTPs with social anxiety might have a hard time opening up to others, for fear that they will be judged and deemed weak. ENTPs with social anxiety definitely have a hard time dealing with these feelings. They enjoy being around people and want to feel free to explore new things. ENTPs with social anxiety with struggle to feel completely at ease with who they are, since they constantly second guess their actions. It is normal for ENTPs to use humor to deflect away from their feelings, and with social anxiety they definitely do this even more. They might have a hard time holding serious conversations, instead they turn just about everything into a joke in order to distract from how they are really feeling. ISTJs with social anxiety often have a hard time stepping outside of their comfort zones. They will keep quiet most of the time, trying to avoid doing anything that will bring them embarrassment. They might even think about their words over and over again before actually speaking to people. When the ISTJ has social anxiety is causes them to feel overwhelmed in the presence of others, and they will often try to avoid being around people as much as they can. The ESTJ with social anxiety can often seclude themselves for some time, but this is often truly upsetting for them. They want to be able to connect with others and often feel best when they are a valued member of their community. With social anxiety the ESTJ often questions their every move, but tries their hardest to hide this from others. They don’t like expressing their feelings, so the last thing they want is for people to realize just how uncomfortable they can become in social situations. ISFJs with social anxiety will definitely try their hardest to hide this side of themselves. They will often seem timid and nervous, constantly hoping to please those around them. The ISFJ will ask others how they are feeling, and constantly strive to come to their aid. At the same time they often feel like they are being annoying to others, and will feel like a burden in many ways. The ISFJ with social anxiety simply questions their actions constantly, and struggles to ever step outside of their comfort zone. ESFJs with social anxiety often second guess their actions constantly, and run them through their minds over and over again. They are so naturally in tune with the emotions of others, and this only become more challenging to handle when they have social anxiety. The ESFJ will likely become weighed down by the constant emotions of others, and will continue to try their hardest to do and say the right thing. They will constantly ask people if they are okay, or if they need something, since the ESFJ wants to be sure they are doing everything right. ISTPs with social anxiety definitely struggle to cope with this, and often makes them feel unlike themselves. ISTPs normally enjoy being by themselves anyways, and with social anxiety they struggle to come up with reasons to encounter other people. They often try to avoid being around new people, and instead want to find ways to avoid new social situations entirely. The ISTP with social anxiety often tries to mask this by maintaining their cool, even though being around people quickly overwhelms them. The ESTP with social anxiety will not stop interacting with people, they simply have a lot of self-doubt. The ESTP will find themselves constantly second guessing their actions, even after they go home by themselves. They will run things over in their minds, feeling like they have caused others to dislike them. They might even ask their loved ones if the things they have done upset them, making them seem a bit needy even when they don’t want to. ISFPs with social anxiety definitely have a hard time interacting with new people. The naturally friendly ISFP struggles to feel at ease in social situations, and will seem very shy. They often seek out someone who they trust and feel comfortable with, and feel more capable of social interaction with this person by their side. They might use them like a security blanket, in order to feel more at ease being themselves even when they feel anxious and uneasy. ESFPs with social anxiety definitely struggle with these negative emotions, and will constantly second guess themselves. ESFPs are happiest when they can be around others, so having to feel this anxiety is often one of the worst things possible for them. They will still remain connected to others, they simply question their own actions constantly. They might even rehearse conversations in order to get through them without constantly doubting themselves.